A rare and beautiful Dorchester, Massachusetts silk on silk needlework attributed to a student from the Saunders and Beach Academy. 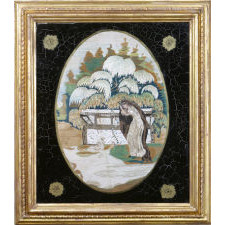 Executed in polychrome silk threads and depicting a woman standing next to a monument with a large willow tree and foliage in the background and a swan swimming in a body of water in the foreground. 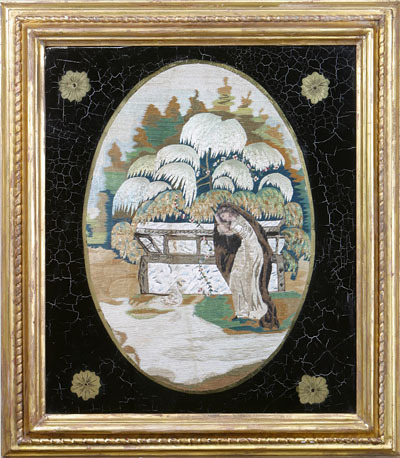 The needlework rests behind a modern black-painted eglomise glass with a gilt chrysanthemum at each corner and centered by an oval window with a gilt painted slip.